From a leader in innovation best practices, 10 simple and practical steps your business must take to achieve profitable growth, through innovation. Timely, accessible, and indispensable, Robert’s Rules of Innovation® is a road map for success through sustainable innovation with a clear message: innovation is the lifeblood of business and the secret to outperforming your competition. 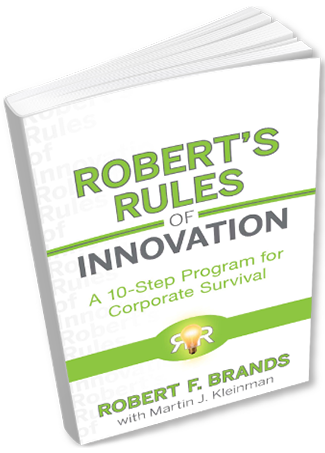 Direct and practical, Robert’s Rules of Innovation® is a must-read for managers at all levels. Read the Forbes article “How Great Entrepreneurs Spell Continuous Innovation" where "Robert's Rules of Innovation" is quoted as a classic. A few weeks ago I received "Robert's Rules of Innovation" by Robert F. Brands with Martin J. Kleinman in the mail. "Robert's Rules of Innovation" is an approachable 200 pages, and is an easy, and pleasant read. Let's face it, whether you manage a multinational company or an entrepreneurial start-up, or if you are a manufacturer, distributor, service provider, supplier, retailer, or a not-for-profit, the pressures today—in terms of time, budget, everything—are unprecedented in our lifetimes. Robert's Rules of Innovation introduces you to easy-to-implement, immediately useful world-class guidance for starting, nurturing, and profiting from a culture of sustained innovation in the work environment. Get passionate about creativity. Prepare to unleash your team's abilities. Create the next home-run new product. Do it all with the high-performance ideas found in Robert's Rules of Innovation.